How come Brad Pitt gets to wear vintage t-shirts and look cool and I don't? I'm a fan of David Fincher's films. First and foremost, I like his visual style. It's slick and dark and all of the other praise (or reprehension) that you've heard from critics of his work. And I think he chooses the correct types of stories to tell (or, possibly, the producers CHOOSE HIM to tell); usually equally dark and clever narratives. When I leave his films I have that odd combination of feeling physically drained but mentally sharp and adroit. That kind of mindset that makes you want to put your expensive sunglasses on at night (in a non-Corey Hart manner) and peel away from the light in your sports car, off to a rave or some mysterious meeting. Unfortunately, I usually buy my sunglasses on the checkout line in the 7-Eleven, and I drive a pick-up truck (as sports cars are impractical for me, both financially and in a physical sense, as I'm tall and, let's say, "husky"). But the point is still clear (I hope); when I leave one of Fincher's movies, I feel cool. There was a three movie stretch where Fincher was continually adding to my coolness. "Seven" (or "Se7en", if you prefer) was the very meaning of the words "taut thriller". "The Game" was less lauded, but equally tense. 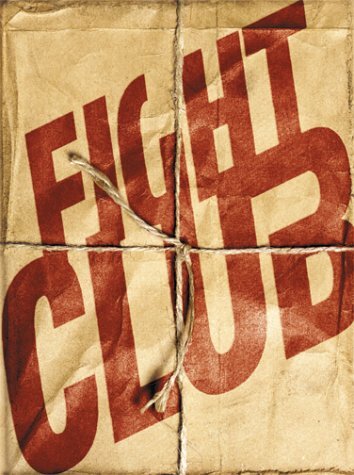 And the subject of this week's review, "Fight Club", was satisfying, if not as intense as it's predecessors. The one thing that all of these films DID have in common, besides Fincher's recognizable cinematic sensibility, was a rug-pulling, punch-you-in-the-face final act surprise that had me (and many others apparently) screaming for more. I'm not here to give away those endings. If you haven't watched any or all of these movies, I recommend you go out and get them. If you have an ounce of kid left in you (albeit, a kid with a stomach for thrills and the occasional splash of gore), then you'll enjoy these movies. If your inner child is dead, you'll be poking holes in the logic, sitting in a cafe somewhere wearing expensive (but different) sunglasses, and a beret I imagine, saying how stupid everyone is for enjoying these movies, and how soulless the filmmakers must be for putting out this stuff. And if the box office is any indication, you'll most likely be alone. I, however, will be watching "Fight Club" and having a fantastic time. The Narrator (Norton) is an insomniac. It has less to do with any sort of stress in his life than with a general malaise that seems to have gripped him. He's managed to carve out a nice little rut for himself, and he seems acutely aware of it as well as completely resigned to it. But the sleepless nights are slowly driving him mad. His doctor tells him that he should basically "buck up", that there are people with REAL problems in the world, like testicular cancer or blood parasites. So the Narrator goes to a support group for testicular cancer survivors, and he soon finds an emotional release (as well as a cure for his insomnia) that he's never experienced before. Before long he's hooked, going each week to multiple groups for a number of maladies that he's not afflicted with. But his joy is short-lived, as he's soon joined at the meetings by another "faker", Marla Singer (Carter). Having such a physical reminder of his own duplicity at the meetings with him soon breaks the spell, and his insomnia returns. He begs Marla to leave so he can return to his blissful slumber, but she finds the free entertainment and coffee to be too addictive and refuses. So he's basically back to square one when he meets a man on one of his business trips named Tyler Durden (Pitt). Tyler seems to possess everything that the Narrator does not; a self-assured attitude, freedom of thought and expression, and regular sleeping patterns. Circumstances soon bring them together, and after an evening of drinking, Tyler tells the Narrator to hit him. The request is born more out of curiosity than any sort of machismo. Tyler says he's never been in a fight before, and neither has the Narrator, so why not get what is thought of by many to be a rite of passage for a man out of the way in what is a relatively safe environment? Have a fight with your buddy, instead of getting into a bar brawl with some stranger who might pull a knife or worse. So they do, and they find that fighting releases some sort of inner peace that neither of them have ever experienced before. Pretty soon they are joined by other seemingly aimless, pre-middle aged men, and Fight Club is born. I really don't want to go any further than this with my explanation of the plot, as not only will it ruin what is a great story for those that haven't seen it, but it'll take forever to map out all of the twists and turns. It's a fantastic story, and from my discussions with it's fans, it seems to hold a very specific spell over a very specific demographic. Namely, men between the ages of 23 and 35 who work at white collar jobs. Something about the boredom of pre-middle aged life for guys that jockey a desk all day is definitely touched on by this film. Or maybe it's just a secret desire to BE Brad Pitt. Pitt is the star here, giving a performance that's the late 90's-early 2000 equivalent of James Dean; the embodiment of cool, Rebel WITH A (very specific) Cause. The entire cast infuses what can be a relentlessly brutal movie with cool humor; the kind of perfectly timed wit that everyone wishes they had, but few possess. The only misstep that I saw in regards to humor was with the character played by singer/actor/dinner entree, Meat Loaf. Mr. Loaf plays a testicular cancer survivor who meets the Narrator at one of his meetings and soon gets involved with Fight Club. While I found myself laughing the most at the scenes that involved him during my first viewing, subsequent viewings have made me like his character less. I don't have any problems with Meat Loaf's portrayal; I think he did a fantastic job. I just think that the writers (I haven't read the book, so I don't know if this can be attributed to the screenwriter, Jim Uhls, or the original author, Chuck Palahniuk) went past witty and into goofy with this character, and it doesn't fit into such a dark picture. The fighting in this movie speaks to the viewer just as much as the characters do. In my case it says, "Man, don't you wish you could just punch someone sometimes? ", which is immediately answered by my inner monologue with, "NO! because they'd most likely punch me back!" The result of fighting is shown with such gory detail in this movie, that any charges against the filmmakers of inciting violence are rendered mute in my opinion. Both Norton and Pitt (and, I imagine, their stunt doubles) perfectly expressed the physical exertion, exhaustion, and pain that would come with getting into a fistfight. If watching this movie made you want to go out and start your own "Fight Club", then you and I are very different people. I'd mentioned earlier that I've watched this movie more than once. And I also mentioned that this movie, like other Fincher movies before it, has a mind-blowing twist during the final third. Obviously, any movie with a twist ending is going to be diminished during repeated viewings. The second and third times around, I'd have to say that "Fight Club" holds up just a little bit better than it's predecessors once the twist is revealed. I think it's the nature of the story that helps. This is a very straight forward narrative with elements of action throughout, while "Seven" and "The Game" were all-out thrillers. The best part of a thriller is NOT knowing what's going to happen. Once you've seen it, it loses the element of surprise. But "Fight Club" has a message. And no, that message isn't, "Brad Pitt looks cooler than you do in tight t-shirts and vintage leather jackets." If you haven't seen it already (and no one has revealed the twist to you), go out and rent it immediately. Find out what it says to you.